Noise control and removal is important in any discipline where clean, clear signals are critical in measurement and data collection. For this reason, whilst the saying ‘Beauty is in the eyes of the beholder’ may be true in many instances, scientific research cannot permit subjective, qualitative thinking to trump objective data. Quality data are the basis of all good research. Poor data give an erroneous understanding of the problem and the solution. For data to be useful, that is, for data to be trustworthy as to make sound business or economic decisions (or any significant decision for that matter), it must meet certain criteria of reproducibility, accuracy, validity and reliability. However, it takes a village to raise a child (as the saying goes), and similarly it takes more than good instruments to get quality data. The accuracy does not come from the data itself, but in the instrumentation, methods and materials used to generate it. This is where the “d” in dPEG® becomes critical in bioconjugation or any other application that can benefit from PEGylation. Discrete PEGs are single molecular weight compounds that are made step-wise like small molecules. Whilst they share many of the advantages of polymeric PEGs such as conferring stability, immunogenicity (1), improved solubility, extended serum half-lives (2) and improved pharmacokinetics among others. Quanta BioDesign, Ltd. dPEG®s are like driving an all-wheel drive vehicle equipped with snow tires on a bad snow day. Subaru says of its All-Wheel Drive system, “Confidence in Motion.” At Quanta BioDesign we say, “Confidence in Science.” There is confidence because of the control that dPEG®s give. The discrete nature of our PEGs makes site specific conjugation very reliable, and make characterization and quantitation easier. Because the exact size of the dPEG® is known, characterization is made simpler, and the researcher can tell what fragment is responsible for the results they are seeing. Over the years there have been great improvements in analytical instrumentation that have removed much noise in measurement. However, there is still noise that cannot be removed by instruments no matter how good it is. So, the options for the researcher are to either wear “big ear muffs” to cut out the noise or to engineer the noise out with a “good muffler.” At Quanta BioDesign, we have opted for the latter solution because we understand the problem, seeing that the bigger polymeric mixtures become cumbersome to the instruments and cloud the data. As an example, Figure 1, below, shows an example of how noise control can be obtained with Quanta BioDesign’s dPEG® reagents. The figure shows the mass spectrum of an Avibody (Avipep Pty Ltd.) PEGylated specifically and cleanly with one of our dPEG® reagents. Figure 1: An example of noise control: a dPEG®ylated Avibody using Quanta BioDesign’s dPEG® reagents. 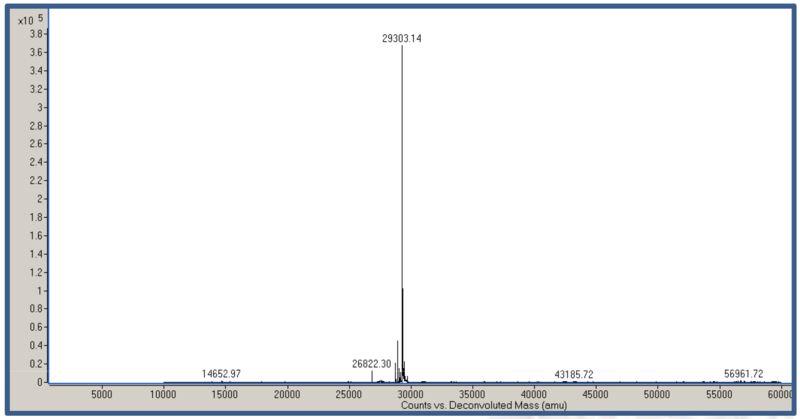 By contrast, Figure 2, below, shows the MALDI-TOF mass spectrum of polydispersed PEG-1500. Noise control is impossible using this PEG! Yet this mass spectrum is typical of many PEGylated products that use the older, polydispersed PEG technology. This noise control and removal also has many other advantages in validating processes and setting specifications. From a regulatory standpoint of drug development and marketing noise reduction improves the chance of success and mitigate against many legal liabilities that can arise from unstable products and data collection systems. Here at Quanta BioDesign we do not simply make and sell dPEG®s. We also give confidence in results. Part of that confidence comes from the ability of our dPEG® reagents to engineer noise control and noise removal into our customers’ products. We believe that we are writing a brief history of the future of science and are confident that the early birds to dPEG® technology shall surely catch the worm. Click here to see our chemical modification reagents, including our branched serum half-life modifiers. Click here to see our chemical crosslinking reagents. Click here to see our biotinylation reagents. James Guyo, MS, MBA earned his Bachelor of Science degree in Chemistry and Biochemistry from the University of Zimbabwe in 1996. Coming to the United States, James then earned his Master of Business Administration degree in 2002 and his Master of Science degree in Chemistry in 2004, both from Wright State University. As Director of Chemistry Operations he is involved in process development and optimization, research and development and scale-up activities among other things. He also has extensive experience doing contract cGMP. You can contact James at Quanta BioDesign, Ltd. or connect with him on LinkedIn.